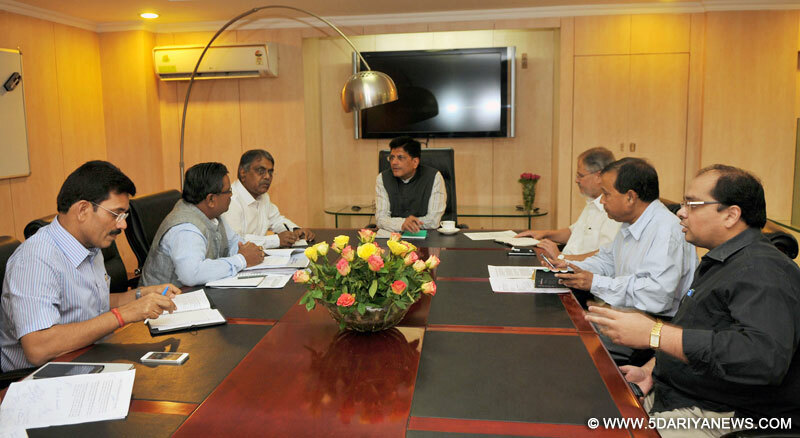 Piyush Goyal, Union Minister of Power had a detailed review meeting on the power situation in Delhi in his office here today in which Lt.Governor, Delhi, senior officials of Ministry of Power, Delhi Government and Delhi DISCOMs were present. 1. Due to extreme heat conditions the unrestricted peak demand of Delhi has reached as high as about 5400 MW this year resulting in load shedding. The situation was worsened because of the recent storm on 30th May 2014 in which the sub-transmission and distribution system of Delhi got affected. Three main transmission lines of 220 kv namely Gopalpur-Mandola, Bamnauli-Papankalan and Bawana-Rohini got severely damaged which affected power supply to East Delhi, West Delhi and Central Delhi. 2.It was observed that the transmission system of Delhi is not capable of meeting peak loads as the system has not been sufficiently upgraded in the last 12 years. Adequate investment in strengthening of the sub-transmission and distribution system has not been undertaken including planning and execution of 400/220 kV lines and sub-stations. This has resulted in overloading and tripping of the existing system as an when the demand has gone up. 3.Ministry of Power however, immediately got into action and helped Delhi Government in restoring the three lines, damaged in the storm, through the Emergency Restoration System (ERS) supplied by Power Grid Corporation of India Limited (PGCIL). Two lines were restored immediately and the third one, Bawana-Rohinihas been restored today. In the meeting taken by Union Minister of Power today, PGCIL was directed to take up permanent restoration of these lines within two weeks against the normal time taken of about two months. 4.NTPC has voluntarily foregone its allocated gas from other stations and requested GAIL to allocate it toDelhi’s Bawana plant to produce another ~400MW power or as much as power as Delhi requires. However due to the inadequate T&D system that exists due to years of inaction by State Govt., Delhi has ability to evacuate only 400MW power more. Hon’ble Minister of Power has the taken the kind approval of Hon’bleMinister of Petroleum for this persion and GAIL has already started releasing the gas to them. Additional power of 400 MW from Bawana is expected to start flowing from tonight itself. 5.BHEL has been directed to urgently commission the unit of Pragati gas based plant urgently, which is under repair. 6. Delhi Government was also directed to effectively monitor the implementation of 8 sub-stations and 7 transmission lines which are under execution by them. These will provide further reliability to power supply. Discoms have committed to make every effort to stick to planned outages. 7. Apart from this, other critical and important lines were also reviewed. Maharani Bagh-Ghazipur line has been directed to be completed in one week’s time with the help of PGCIL. 8. DMRC was asked to assist DTL to repair the Maharani Bagh-Trauma Centre line within one week. Similarly, 400kVDadri-Loni-Harshviharline will be completed in two weeks. This is likely to give relief to East Delhi when the peak load increases. 9. A 100 MVA transformer at Masjid Moth is being repaired urgently to give relief to South Delhi. It was also directed that the fault of Badarpur-Noida-Ghazipur line should also be corrected at the earliest. 10. PGCIL has been directed in order to help the Delhi Govt. meet its power requirement to immediately place at their disposal one 315 MVAtransformer in Delhi and energize it on priority. Further, two more ERS systems have been requisitioned by PGCIL to take care of any further emergencies. 11.Distribution Utilities / DisComs have also been asked to carry out the maintenance and upgradation of their distribution system urgently and remain available 24 hours to solve the grievances of consumers at their end. 12.A daily bulletin on planned power outages will be issued by DISCOMs at 8.00 AM everyday. 13. Delhi Government will also issue a daily bulletin at 5PMprescribed above on the progress of various works being undertaken on priority. 14. Apart from the above immediate measures, the Union Minister also directed that the long term plan for a reliable power system operation in Delhi and upgradation/creation of necessary infrastructure may be drawn up at the earliest by the Delhi Government. 15.Central Govt. will assist the State Govt. of Delhi and their Utilities to complete all the tasks in a time bound manner, to provide continuous and reliable power to consumers of Delhi at the earliest.